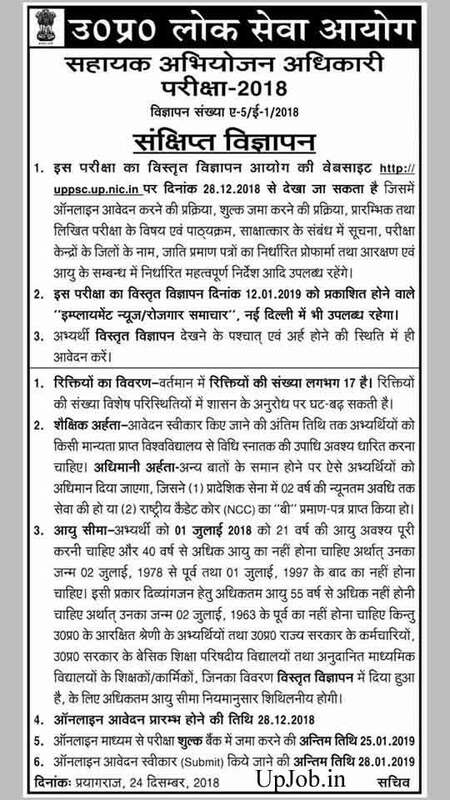 Very good news is coming for Law Graduates of uttar pradesh who are waiting for the notification of APO Assistant uppsc assistant prosecution officer Vacancies. Uttar pradesh Lok Sewa Ayog has published official advertisement for filling posts of Sahayak Abhiyojan adhikari APO posts. Last vacancies of APO were published in 2016 for filling 400 posts. Now once again commission decided to fill posts of Sahayak Abhiyojan adhikari Bharti 2018. Commission has published notification for three big examinations with this month which are APO Sahayak Abhiyojan adhikari, Van Vibhag (Forest department) Ranger posts and lower Subordinate service 2018. Ayog completed mostly all preparation for publishing all these notification for this upcoming vacancy for APO for law graduate. Commission last month published the official Exam calendar and Date sheet for Upcoming Recruitment and Job notification. Upjob.in also published the UPPSC Time Table for all vacancy which may fill before the august but commission not published any news or exam date regarding the APO upcoming recruitment and Lower PCS posts. That’s why competitor was worried regarding why commission not published any information regarding the APO posts and, Lower PCS 2018. But now commission has published the official advertisement within this for APO posts. Every year many lakh LAW graduates are appearing in this examination that’s why Llb degree holder is waiting for this notification with eagerly. Total No of vacancies of APO are 17 including various categories. Selection procedure: selection of the eligible candidates for APO posts will be done through the 3 stage selection methodology. First of all preliminary Recruitment examination will be conducted for all candidates. After that those candidates who will be declared qualified in the written examination they will be call for Main Examination. In the last those candidates who will be declared qualified in the Pre, main examination they will be call for personal interview test. Commission may conduct pre examination at various examination centers of Allahabad and Lucknow district. Commission will conduct a state level written Exam on mid of September for the posts of Assistant prosecution officer. Question of GK and LAW of the written examination will be objective type and MCQ based. Minus marking will be not applicable in this examination. GK Section will carry total 50 marks and Law section will carry total 100 marks. Question paper will contain 150 objective type questions which will carry 150 marks. 1 mark will be awarded for each correct question. APO Personal Interview test Total: 50 marks. 1566 candidate declared qualified for Main examination. Then click Apply for filling application form and Click View advertisement for download notification in Hindi, English in .PDF of or .Doc / docs No other mode of application will be accepted. Application Fee: all applicant who are desirous for filling posts of APO they can deposit application online at the official website of UPPSC Via Using SBI I Collect Services. You can use your ATM Card / Debit card / Credit card / Net Banking for paying application form fee. In case you want fill application form fee via E Challan then generate E Challan form after completing part 1 registration online and pay application form fee in your nearest SBI branch. Official Notification will be also publish employment news / Rozgar samachar and Local news paper of uttar pradesh. UPPSC APO written Exam 2019 | recruitment of assistant procedure officer.